In my previous story post, I wrote about a couple of the beats that I was committed to seeing in the film. These beats give a basic idea of the events that will happen in the film, but they don’t give any idea as to what I want those events to mean. The meaning and other such meta-narrative parts of telling a story is where theme comes in and the theme of this film is “Responsibility”. 1)Causal Responsibility, to be responsible for having done some thing. 2)Accountable Responsibility, to be held as responsible for looking after some one or some thing. 3)Acting Responsibly, to adjust and adapt your behaviour in terms of its consequences. Perhaps writing in this way is too oblique to be clear, let me think of examples. 1) Causal responsibility: I knocked a glass of water over. 2) Accountable responsibility: I’m going to make sure this water doesn’t spill. 3) Acting responsibly: I’m not going to put the glass on this desk next to the computer. So what does all that mean and how am I going to use it in the story? I’m not sure entirely, but growing the story beats towards these themes is the goal of the improvisation work. 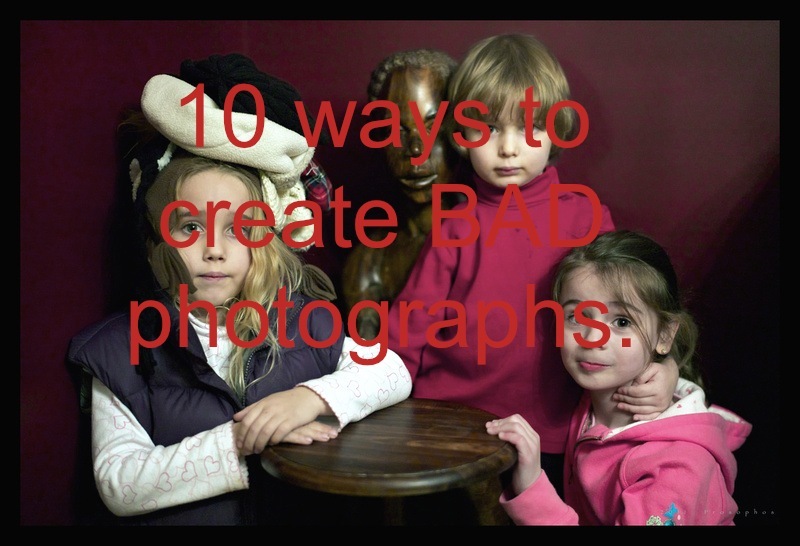 10 ways to create bad photographs. I’m not sure whether this applies to the sanecinema blog precisely, however the thoughts are similar to ones I would express in filmmaking and his photos have a special something, so I think the followers of this blog might appreciate me sharing. This is meant to be lighthearted — and instructive 🙂 …Enjoy! Shoot from your head, not your heart (if you lack passion, your images will be found lacking). Shoot by first surrendering your brain (leaving the camera on auto-everything leaves everything to chance). Shoot without honing (there is no substitute for practice, practice, practice). Shoot as if your camera is a machine gun (indiscriminately pressing the shutter to photograph everything often captures nothing). Shoot when the light is un-magical (good light helps all photographs, always!). Shoot from one spot (don’t work for the shot and the shot will likely not work). Shoot it all (being overly-inclusive obscures your photographic vision). Free tickets to the premiere for anyone who guesses the reason behind the names Rosemary / Mrs Speers.